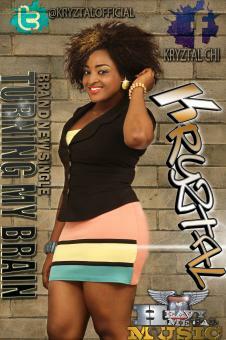 KRYZTAL , a Star Quest 1st runner up, 2011, is a highly talented singer and song writer. The Pure and Industrial Chemistry graduate from the University of Nigeria Nsukka is a music consultant ,voice-over artiste, a stage performer and a model. Kryztal has worked on project such as the GLO theme song, National Sports Festival Lagos 2012 theme song, Star Quest live shows and several radio and television commercials. She has consulted on voice- over jobs for Globacom, Visafone,Conoil,Oando,Total Gaz,eTranzact, to mention just a few. The exceptional vocalist from Imo state has also worked and performed on stage with great musicians like Ras kimono,Shina Peter, 2face ldibia, Alex O,Mike Okri,Oritz Wiliki, Gloria,Ibru, kween and several others. Cindarella and Waka Waka are the first musical issues from Kryztal. The two songs which are definitions of a new musical genre, a cross between R&B, Dance-hall and TECHNO-FUNK are expected to light up the clubs, dance floors and parties of musical aficionados.